La-La Land Records and Paramount Pictures proudly present the remastered and expanded presentation of acclaimed composer James Horner's (STAR TREK II: THE WRATH OF KHAN, ALIENS, GLORY, TITANIC) original motion picture score to the 1992 feature film dramatic thriller PATRIOT GAMES, starring Harrison Ford, James Earl Jones, Anne Archer and Sean Bean, and directed by Phillip Noyce. Horner's intense, Irish-tinged score expertly supports and builds this political thriller's complex characterizations, brooding intrigue and white-knuckle suspense. 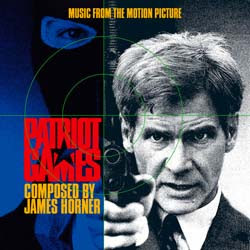 Produced by Dan Goldwasser and mastered by Mike Matessino, Horner's PATRIOT GAMES score is finally given the deluxe treatment it deserves in this 2-CD set, which contains more than 50 minutes of previously unreleased music. Exclusive liner notes by writer Jim Lochner take you behind-the-scenes of the film and its score. This is a limited edition of 3000 Units.